A traditional IRA allows you to save and invest pre-tax dollars, which can grow tax-deferred until distributions are taken in retirement years. Above age 59.5, you are eligible to withdraw funds to support or supplement your retirement lifestyle. Unlike a Roth IRA, which has no mandatory minimum distribution requirement, a traditional IRA comes with strict withdrawal rules: by age 70.5 you are obligated to start taking distributions if you haven’t already done so. The reason you can escape mandatory distributions when holding a Roth IRA but not when holding a traditional IRA is that after-tax dollars are used to contribute to a Roth IRA, so the government receives tax payments upfront. In a traditional IRA, the government doesn’t receive tax payments until withdrawals are made, and so to ensure they do eventually get paid, they require you to take distributions by age 70.5, though you are eligible to do so starting at age 59.5. Between age 59.5 and 70.5, you are free to take withdrawals if you wish or continue to enjoy the benefits of tax-deferred investing. If you begin to take payments, you will be taxed but not penalized. If you wish to receive payments prior to age 59.5, you will be charged a 10% penalty on withdrawals in addition to taxes unless certain withdrawal exceptions are met. When Are You Required To Take IRA Distributions? Early withdrawals penalties of 10% plus taxes may be avoided when certain conditions are met when buying a first home, electing to take substantially equal payments, paying for unreimbursed medical expenses or health insurance premiums when unemployed, and upon permanent disability or death. For the most part, penalty charges of 10% plus taxes will be applied to any withdrawals before age 59.5. However, the IRS does stipulate certain exceptions to the rules which permit you to withdraw funds penalty-free, such as those listed below. The IRS is lenient when it comes to its definition of a first home. If you (or your spouse) has not owned a principal residence in the past two years, the IRS allows you to apply money withdrawn from your traditional IRA to the purchase of a home within 120 days. Because of the risks inherent when closing on the purchase of a home, it is best to err on the side of caution when you withdraw funds to ensure you don’t miss the time window. A maximum of $10,000 can be applied towards the purchase of a new home, or if you are a married couple, you can each contribute up to $10,000 for a total of $20,000. 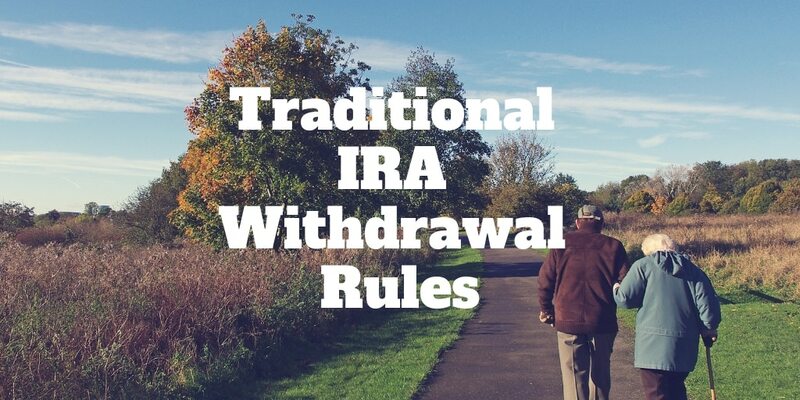 It is permissible to use this IRA withdrawal exception not just for you (and your spouse) but also for other family members, including children, grandchildren and parents. The IRS is lenient in who can enjoy the benefits of penalty-free withdrawals. You can apply withdrawn money to pay for qualifying higher education expenses incurred not just by you but also your spouse, children and grandchildren too. As morbid as it seems, the IRS calculates your life expectancy and uses that projection along with your account balance and other factors to assess the amount of distributions you may receive when you elect to take substantially equal payments prior to age 59.5. It might seem counterintuitive that on the one hand the IRS penalizes you 10% for taking distributions prior to age 59.5 and on the other you are permitted to take withdrawals as long as they are substantially equal. The catch is that if you elect to take distributions that are substantially equal prior to age 59.5, you cannot change your mind: you must continue taking payments at least once per year according to the schedule you first chose. After 5 years or when you reach age 59.5, whichever comes later, you are allowed to modify your payments schedule, but given how onerous this stipulation is you should carefully evaluate the pros and cons before electing it. When unemployed, your IRA may be tapped penalty-free to pay for unreimbursed medical expenses that exceed 10% of your adjusted gross income. A caveat to this exception is that no distributions are permitted 60 days after the time you begin a new job. To better understand how this exception works, consider this example where your adjusted gross income is $50,000 annually and you incur unreimbursed medical expenses of $7,500. Based on the 10% rule, you may use your traditional IRA to pay for any unreimbursed medical expenses over $5,000 (10% of your $50,000 AGI). So in this case, you may dip into your IRA for $2,500 ($7,500 total minus $5,000). You are also permitted to take a distribution when unemployed to pay for health insurance premiums not only for yourself but also for your spouse and children. The 60 day rule applies here also whereby distributions must be made within that timeline after you start a new career role. No penalties are applied by the IRS when dipping into IRA funds following a permanent disability. Upon death of a traditional IRA account holder, the named account beneficiary is provided penalty-free access to funds. IRA distributions must be made by Dec 31 each year. If you turn 70.5 this year, you are obligated to take a first payment (if you haven’t previously) by April 1 next year. The government requires you to take a required minimum distribution by April 1 of the year following the year when you turn 70.5 and once you start taking distributions you are required to continue taking them each year by Dec 31. So if you turn 70.5 this year, but don’t take a first payment until the first quarter of next year, you will still be obligated to make another payment by Dec 31! If you miss your required minimum withdrawal deadline, the IRS will apply a 50% penalty to the amount not disbursed, so pay close attention to the timelines! ‹ How Much Can I Contribute To A Roth IRA?